6,950± sq. ft. office building, currently built out for medical use. Convenient location offers ample paved parking. 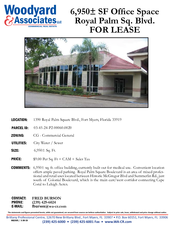 Royal Palm Square Boulevard is an area of mixed professional and retail uses located between Historic McGregor Blvd and Summerlin Rd., just south of Colonial Boulevard, which is the main east/west corridor connecting Cape Coral to Lehigh Acres. Address: 1390 Royal Palm Square Blvd. Location Description: Located between McGregor Blvd and Summerlin Rd., just south of Colonial Boulevard.